Log A spidery creature that drops down on webs. It can shoot out three web-wads to attack consecutively. That's a Pider. ICK! They gross me out. Max HP is 5, Attack is 2, and Defense is 0. EWWWWWWWWW! Besides its normal attacks, it might spit three web-wads at you consecutively. You'd better have good timing if you wanna guard against its attacks. It also says here that the Punies can't stand Piders. So I'm not the only one! Just the sight of these things makes Punies flee in terror. I know how they feel! 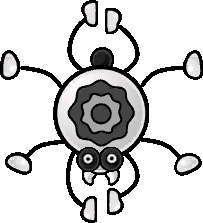 Piders are enemies in Paper Mario: The Thousand-Year Door. They live in The Great Tree and are the only known natural predator of Punies. As their name indicates, they are a spider-like creature, and just like everything else in the Boggly Woods, Piders are monochrome in color. It has two attacks. The first one involves spitting a ball at Mario, dealing 2 damage. The second one involves it spitting out three webs in quick succession, each one taking away 1 HP from Mario's HP bar. Like Scuttlebugs, Piders have round bodies and suction cups on their feet. They also appear in the Glitz Pit as fighters, along with other enemies from Boggly Woods, and have stronger relatives known as Arantulas in the Pit of 100 Trials. Paidāsu An anagram of supaidā (the transcription of the English word spider). If there's an even amount of Piders in the battle, they will alternate between half being high up and half being down low. However, if there's an odd amount of Piders in the battle, they will all be at the same height. If any Pider in battle is unable to move, all the other Piders won't move up or down. This page was last edited on April 9, 2018, at 21:08.